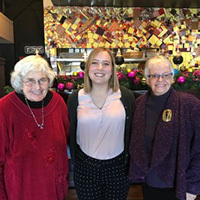 On Friday, Dec. 8, Webster University donors and alumni were honored with a luncheon at Cyrano’s to celebrate the 15th Anniversary of the Colonial Williamsburg Field Studies Program. Attendees celebrated the success of the living history program in Tidewater Virginia and donors, Julie Lineberry '70, Carol Colligan '70, MaryEllen Pearson '60 and Ellen Eliceiri (MA '93) were honored for their generosity with a small gift from Williamsburg. A few former and current students told anecdotal stories and then thanked alumni for their scholarship contributions. Since 2002 over $20,000 in scholarships have been awarded to students, both undergrad and graduate, to attend the four-day immersive program in history. 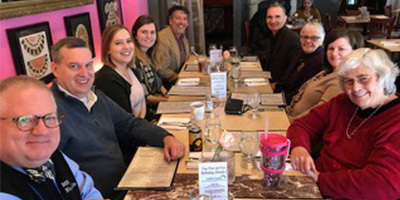 Ken Nickless, development director for Planned Giving, was also honored for providing connections in donor support from the onset. Ted Green, professor in the Teacher Education Department of Webster's School of Education, developed the Living History program in 2002. He has taken 17 groups of students and three groups of alumni over the past 15 years. Colonial Williamsburg Field Studies Program.